The locavore in me leads to cranberries at this time of year. Scooped in bulk from cases in nearby farmers’ markets, they’re superior to the not quite ripe berries mass produced in New England and distributed for a few short months in late fall. Although associated with the Thanksgiving turkey feast (or processed into over-sugared bottled drinks), cranberries are actually more versatile and can take their place with the best of chutneys. 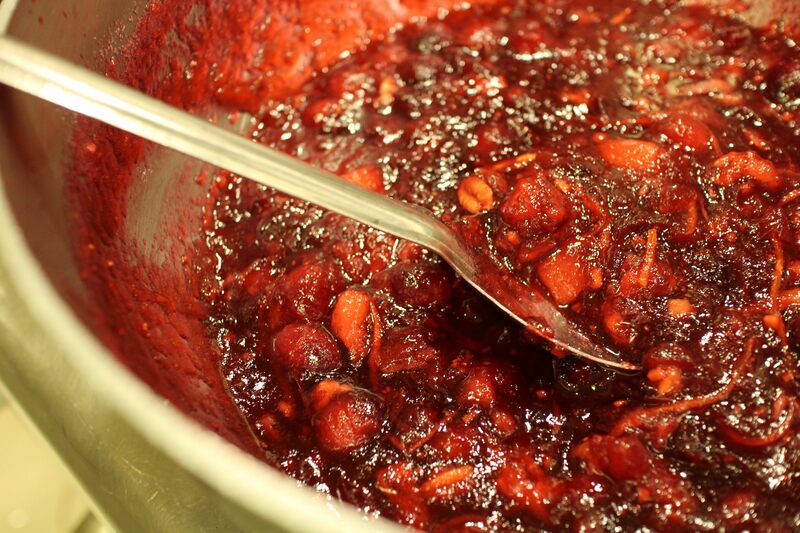 I’ve been considering how to produce interesting chutney but in the meanwhile came across cranberry jam with apples, nuts and ginger in Kevin West’s awesome book Saving the Season. This is good, really good. With thin slivers of orange peel, pecans, minced ginger, apples and a splash of bourbon, the jam is a dream condiment served alongside poultry or paired with runny cheese on a holiday appetizer platter. Prepare jars for water bath canning (makes four 8 oz jars). Place a saucer in the freezer for testing the gel. 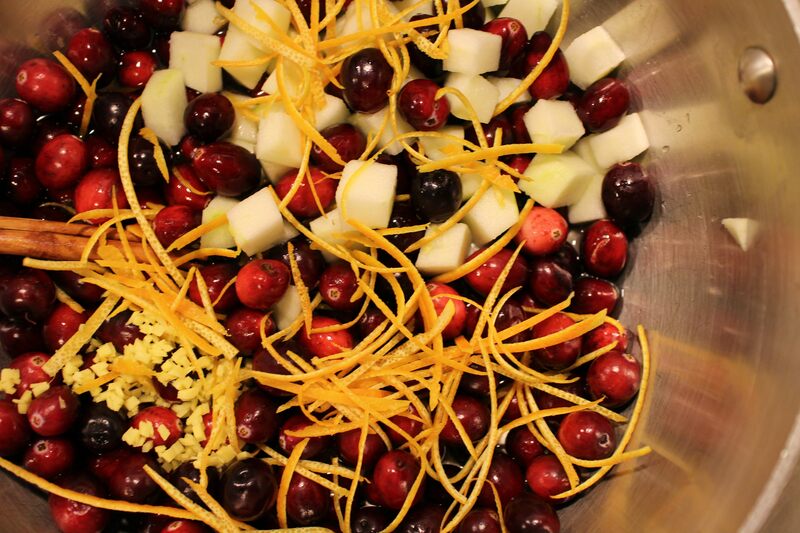 Rinse the cranberries, removing any small stems. Put them in a saucepan with water, apple, ginger, cinnamon and orange zest. Bring to a boil, lower the heat and simmer for 5 minutes until the berries pop. Add sugar, stir to dissolve, and bring the mixture to a gentle boil. Add the nuts and cook for 2-3 minutes, stirring constantly to prevent scorching. Test the gel. Add the bourbon and cook for about 30 seconds longer. Remove the cinnamon stick and ladle the jam into hot jars, inserting a thin knife or chopstick to release any air pockets. Leave ½ inch head space. Seal with a two-part lid and process in a water bath for 10 minutes after the water boils. Turn off the heat, remove the canner lid and let sit for 5 minutes before removing to a counter to cool undisturbed. Makes four 8 oz jars.